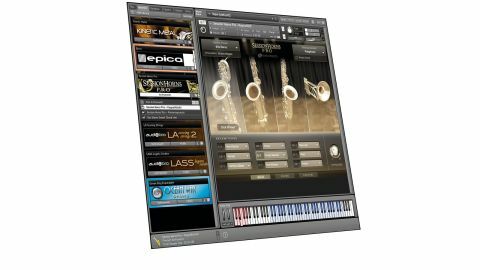 Session Horns Pro is an excellent way to get realistic sounding horns in many musical styles. A wide range of instruments and textures. An excellent set of articulations. Powerful auto arrange features - great if you're not used to writing for horns. Recording a brass section is one of the most complex tasks a producer has to face. Getting the right arrangement, the right blend of instruments and the right players tends to mean the process can be long, and expensive. Sampled sections make sense, especially if you are inexperienced in writing and directing for horns, but you need great samples and plenty of articulations to get it right. Native Instruments have gone all out to make Session Horns Pro as broad and playable as possible. "The breadth of articulations and dynamics, quality of samples and the MIDI control let you find exactly what you are looking for"
On launch you can choose sections or solo instruments. Launching a section gives you four slots into which are placed a selection of instruments or combinations of instruments. If you launch a keyswitch version, then articulations are swapped using the C-1 octave. The Voicing Assistant feature lets you choose between various playing modes. Polyphonic will play as many notes as you hold down, whereas Smart Voice Split assigns voices according to what you play. Hold down a single note and, if it's in the range of all the instruments, you get all four in unison; adding more notes up to four splits out the voices in an intelligent way keeping section size accurate each time. In addition you get Legato mode which always works in unison and Chord and Legato does exactly what you would expect. For those who want some help in getting an arrangement together there are two paths. The first is Animator. This is a series of phrases, which can be changed using the keyswitch octave. You just hold chords or notes and Animator does the rest. There is a genre specific style pull-down menu and in the utility page you also have the option to set your own keyswitch set by dragging and dropping phrases from any genre. Alternatively you can use Smart Chord which works together with Smart Voice Split. Here you set the key and then play monophonically and Smart Chord fills in the chords for you with intelligent and realistic sounding voicings. White keys play the notes and the black keys give style variations. Both of these methods work well and are a great way of getting started. There is also a built-in mixer where you can adjust pan and balance for each slot and some excellent processing tools. Individual slots have compression and EQ and there are global settings for compression, EQ, Tape, Twang! and a low-pass filter. Native Instruments have put a lot of thought into developing Session Horns Pro. Whether you use it as a solo instrument or a section, with auto arranging features or build parts from the ground up, the breadth of articulations and dynamics, quality of samples and the MIDI control let you find exactly what you are looking for. Excellent stuff!